Cardiovascular disease (CVD) incorporates the disorders of the heart and circulatory system, including coronary heart disease (angina and heart attacks), peripheral arterial disease, aneurysms and stroke. This factsheet examines the links between smoking and CVD, smoking as a risk factor, the mechanisms by which smoking causes these diseases and how a person’s risk may be reduced. Smoking is a leading cause of cardiovascular disease, causing around 25,000 deaths a year from heart and circulatory disease. Around one in five premature deaths from heart and circulatory disease are linked to smoking. may increase by as much as 30 percent during the first 10 minutes of smoking. Nicotine stimulates the body to produce adrenaline which makes the heart beat faster and raises blood pressure, therefore causing the heart to work harder. The carbon monoxide in tobacco smoke exerts a negative effect on the heart by reducing the blood’s ability to carry oxygen. Smoking can increase blood cholesterol levels. Furthermore, the ratio of high-density lipoprotein cholesterol (the “good” cholesterol) to low-density lipoprotein cholesterol (the “bad” cholesterol) tends to be lower in smokers compared to non-smokers. Smoking also raises the levels of fibrinogen (a protein which causes blood to clot) and increases platelet aggregation which makes the blood more sticky. Carbon monoxide attaches itself to haemoglobin (the oxygen-carrying pigment in red blood cells) much more easily than oxygen does, which reduces the amount of oxygen available to the tissues. All these factors make smokers more at risk of developing various forms of atherosclerotic disease, which is when coronary arteries become narrowed by a gradual build up of fatty material within their walls. As the atherosclerotic process progresses, blood flows less easily through rigid and narrowed arteries and the blood is more likely to form a thrombosis (clot). This sudden blockage of an artery may lead to a fatal heart attack, a stroke or gangrene of the leg. The heart needs a steady supply of oxygen-rich blood to function effectively. 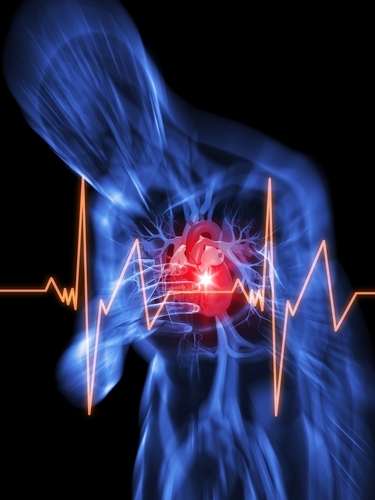 Coronary heart disease (also known as coronary artery disease or ischemic heart disease) is a general term that describes conditions caused by an interrupted or diminished blood flow through the coronary arteries to the heart muscle. Smokers are more likely to die of a heart attack: according to the British Heart Foundation, mortality is 60% higher in smokers (80% higher in heavy smokers) compared to non-smokers. People under the age of 40 had a five times greater risk of a heart attack if they smoked. If the other main risk factors for CHD are also present then the chances of having a heart attack can be increased eight times. Even light smokers are at increased risk of CHD. A large Danish study found Mortality from cardiovascular diseases is higher amongst smokers who started smoking at an earlier age, regardless of the number of smoking years. The British Regional Heart Study cites three principle non-hereditary risk factors for Coronary Heart Disease: smoking, cholesterol and high blood pressure. More recently the European Prospective Investigation into Cancer and Nutrition (EPIC) examined risk factors for myocardial infarction and concluded that smoking is one of the leading risk factors.10 A 2010 national cohort study of nurses in the United States found that while smoking-related risk was greatest for lung cancer, CHD had a higher number of attributable deaths as a result of smoking. The report authors assert that the risks of smoking were far greater than previously thought. Even light smokers are at increased risk of CHD. Mortality from cardiovascular diseases is higher amongst smokers who started smoking at an earlier age, regardless of the number of smoking years. A stroke (also known as cerebral thrombosis or cerebro-vascular disease) occurs when blood flow to the brain is interrupted causing brain cells to become damaged or die. It can affect the way your body or mind functions. It is currently the second most common cause of death world-wide after heart disease. The World Health Organization has predicted that this will still be the case in 2030, with stroke expected to account for 12.1% of all deaths. A number of studies have identified a relationship between smoking and stroke. It has been estimated that 11% of all stroke deaths are smoking related, with the overall relative risk of stroke in smokers being about 1.5 times that of non-smokers. A New Zealand study showed that passive smoking as well as active smoking significantly increased the risk of stroke in men and women. An aneurysm is a bulge in a blood vessel that is caused by a weakness in the vessel wall. As the blood passes through the weakened part of the vessel, the blood pressure causes it to bulge outwards like a balloon. There is a danger that the aneurysm will cause the artery to burst (rupture) causing organ damage or internal bleeding, both of which can be fatal. Aneurysms occur most commonly in the aorta (the main artery in the heart that pumps blood out into the body) or in the brain (referred to as an intracranial aneurysm) but can occur in any artery in the body. An intracranial aneurysm which occurs near the surface of the brain may lead to blood seeping into the space between the skull and the brain. Smoking is an important determinant of the risk of death due to aortic aneurysm. Smokers are very much more likely to die from a ruptured aneurysm of the abdominal aorta than non-smokers and smoking has a direct effect on the risk of abdominal aortic aneurysm. A British study of over 5,000 men and women aged 65-79 years found that smoking was the most important avoidable risk factor for abdominal aortic aneurysm. Smokers who also have certain chromosomal variations are a significantly increased risk of intracranial aneurysm. It has been estimated 70 to 80 % of people who have an aneurysm are current smokers or former smokers. There is also research which suggests that there is a correlation between smoking and aneurysm recurrence. Peripheral Arterial Disease (also called Peripheral Vascular Disease) is a disease that affects the arteries. Most forms of PAD are caused by a gradual build-up of fatty material in the walls of the artery, a condition called “atherosclerosis”. Over time, one or more of the principal arteries may become so narrow that they are unable to deliver oxygen-rich blood to the limbs. In severe cases, the blockage can cause gangrene requiring amputation. The exact mechanism by which smoking induces atherosclerosis is not fully understood. However, smoking appears to be a significant risk factor in the development of PAD in a number of ways. Nicotine and carbon monoxide constrict the blood vessels. This problem is exacerbated by reduced oxygen supply to the tissues because the carbon monoxide in tobacco smoke attaches to haemoglobin (found in red blood cells) leading to elevated levels of carboxyhaemoglobin. The lack of oxygenated blood is a cause of ischaemia, which can cause ulceration and gangrene. Smoking also encourages thrombosis (blood clots) by increasing platelet stickiness. Chemicals in tobacco smoke damage endothelial cells which line the walls of blood vessels. Smoking stimulates the formation of a fatty-substance called atheroma which leads to a narrowing of the arteries and reduces blood flow. This in turn causes a shortage of oxygen in smaller blood vessels and capillaries. This is known as ischemia. Buerger’s Disease is a rare form of PAD that most commonly affects the small and medium-sized arteries, veins, and nerves of the arms and legs. There is an extremely strong association between the heavy use of tobacco and Buerger’s disease, although there is some evidence to suggest that users of smokeless tobacco are also at risk. The disease typically occurs in young male smokers, aged 20 to 40. The only proven treatment to prevent progression of the disease and avoid amputation is the complete cessation of smoking or other use of tobacco. The 2004 report of the Government appointed Scientific Committee on Tobacco and Health (SCOTH) found that exposure to second-hand smoke is a cause of heart disease. They estimate that there is an increased relative risk of about 25%. The Institute of Medicine in the United States also confirms that exposure to second-hand smoke is a cause of heart disease in non-smokers. Exposure to second-hand smoke can increase the risk of CHD by 50% to 60%. The effects of passive smoke exposure on the heart can be rapid.60 example, a Japanese study has shown that just 30 minutes of exposure to environmental tobacco smoke by healthy non-smokers can have a measurable impact on a coronary blood flow.61 There is now also evidence that passive smoking is associated with increased risk of stroke in men and women.